roads where the deer would come frolicking out of the trees. Things have changed. With the advent of coyotes boldly coming into town the deer population has stopped frolicking and is now running for its life with Wile E. Coyote nipping at their puffy little white tails. Instead of bolting into traffic from the tree line the Dinners With Cloven Hoofs are coming out from between houses and backyard swing sets. I see their tracks in the snow in our driveway. Surprise! 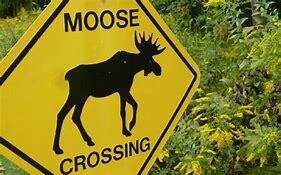 One time, long ago and in a galaxy far, far, away (Canada) I recall seeing signs alongside the roads announcing “Moose Crossing.” Imagine having to deal with a thousand pound deer with a chip on its eight foot high shoulder. Hit one of those massive critters and everyone will have to wait until Spring to separate your remains from the twisted chassis of your car. That is one reason (Among many) I have avoided Canada in recent decades. This time of year in Indiana there are millions of deer/automobile matings. The deer loses. The car loses and if you are not lucky – you lose as well. Years ago I had a friend who had a head on crash with a well-antlered male deer. The deer, which was considerably larger than Bambi, came through the windshield, impaling itself into the passenger side seat. She was in the car alone – except for several hundred pounds of wounded and terrified animal. It all ended poorly. The deer died inside the car and my friend spent a month in the hospital. Now, in late-January I am leery of driving at night around town with deer merging into traffic without signaling. I think I’ll just go to Las Vegas and have a 99 cent Shrimp Cocktail. Here in Helena, MT the city now harvest the deer each year and donates the meat to the food banks. It was so bad that I had to push them out of the way to get to my mailbox. Lovely creatures until there are too many of them. Be safe my friend.